Our Gold Pelicans love flashlights! The Gold Pelicans have recently been exploring with flashlights. 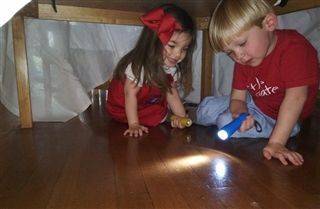 The flashlights have been under the table, cascaded through the air, placed under the clear table top easels, and used as centerpieces while having snack...all while the lights are out in the classroom. We wonder what the Gold Pelicans are going to shine their lights on next!